There is an old adage, that when your fellow man is in trouble, you help out. You don’t ask why, you just help out. I hate that government employees – those who protect our skies and protect our food and protect our parks and protect our selves – are being squeezed by our uncaring President. 800,000 workers losing their paychecks for no discernable reason. They did nothing wrong, and they’re being punished because our micro-fingered President Cheeto wants $5.7 billion for his own personal Maginot Line. Ugh. I’ve heard horror stories of government workers worried about their homes and their families. And that hurts. It hurts all of us. I can’t do much … but I can do this. 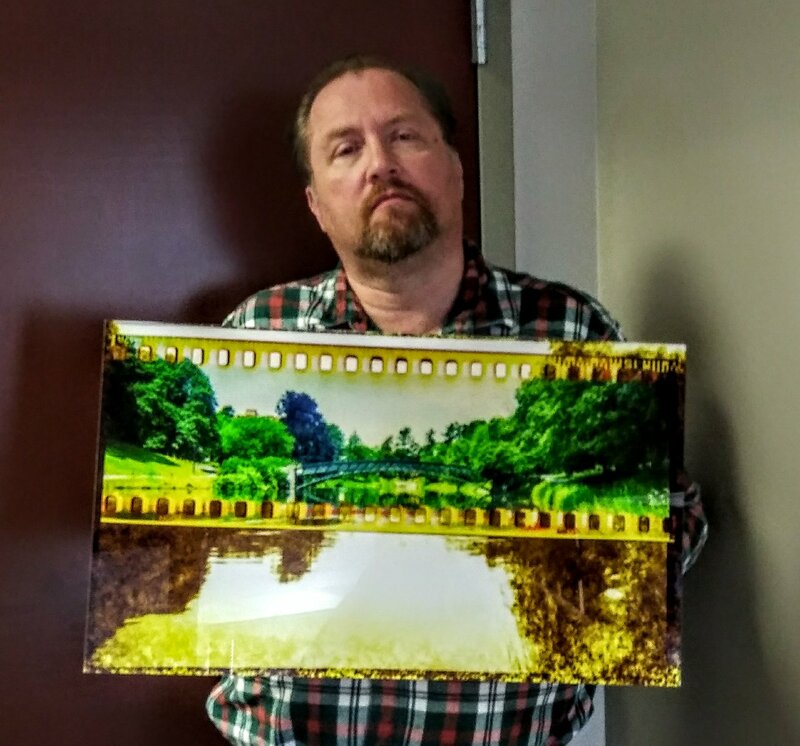 What I have here is an acrylic print of my award-winning photo The AGFA Bridge Over Ansco Lake. I made an acrylic print through the good people at ArtBeat Studios, the Anaheim-based print shop that created my recent aluminum-substrated prints. This print was, for all intents and purposes, a vanity printing – one that would remain in my home and in my collection. But it’s not as important to me as helping someone in need. Therefore … I’m selling it. Right here on my etsy site. And here’s the big prize for you, my beloved readers. The entire purchase price will immediately be forwarded to The Food Pantries for the Capital District, a local charity that provides food and products and supplies to those in need. Your only cost is the print. Shipping and packaging costs will be borne by me. This print measures 18″ x 28″ and contains all the hanging brackets. It will be shipped via UPS to any destination within the continental United States, and with UPS International if the purchaser is from another country. And if this print sells … great. I’ll put another print up on etsy and sell that one as well. And I’ll keep selling my artworks and photos and crafts … with all proceeds going to The Food Pantries of the Capital District … until our government can return to operation and our Federal employees receive their much-delayed reimbursements for their services performed. I hate that our hard-working men and women are going through this right now. So let me start with this project first… and if this works … if this helps feed a family or two, helps a Federal worker get diapers for her child or food for her table… then it’s worth it. And if this works … I have other prints that I can put on etsy as well. Trust me, I’d rather that the proceeds from this sale help someone in need. That’s the most important part of where we are. You’re a good man, Chuck Miller.